You have to be the owner of the organization to be able to delete it. Deleting an organization irreversibly removes all your data. If you want to cancel your paid subscription and downgrade a plan to free instead, visit this page. 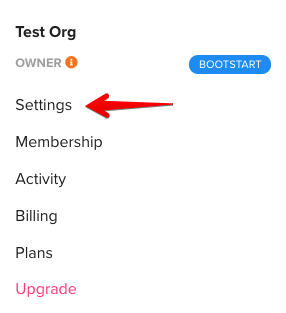 Select Settings from the drop down in the top right. 2. On the organization settings page, scroll to the bottom to see the instructions for deletion. Your organization and its data will be deleted. If you have a subscription it will be canceled immediately and you will no longer be charged. Deleting an organization irreversibly removes all your data. If you want to downgrade a plan to free instead, visit this page.